Seesmic has released Seesmic Desktop 2, its “one app to rule them all” Mac client which puts multiple social networking services into a single window. Seesmic Desktop 2 provides immediate support for Twitter, Facebook, LinkedIn, Google Buzz, Foursquare, and Ping.fm, but it also sports a system allowing users to download additional plug-ins providing access to different services. Plug-ins included in the standard download, for example, can shorten a URL with bit.ly, or preview an image from Flickr or Twitpic when they’re linked in your incoming messages. Seesmic’s Plugin Marketplace is the app-store style method of browsing what’s available, with one-click installation into Seesmic Desktop. 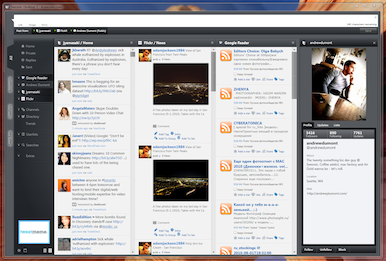 Seesmic’s interface shows each social networking stream as a separate column in its window, with scroll bars if you have more services than horizontal display space. This is not an application which lives unobtrusively off to one side of your monitor, but works great as a heads-up information display if you have a multiple monitor setup with plenty of space away from your main work area. You can also use pop-up notifications to let you know when new messages come in (as if there’s a moment of the day when they don’t). Seesmic requires Microsoft Silverlight, and if you don’t have it (or if your version is outdated, as mine was), Silverlight will automatically download as part of the installation process. Silverlight, in turn, requires an Intel Mac, and Mac OS X 10.4.11 and later. Seesmic Desktop is a free download, and despite the name, so are the (current) plug-ins in the Plugin Marketplace.